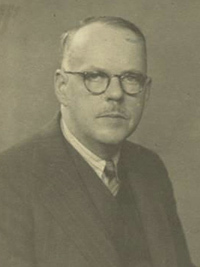 John Stanley Ogden, manufacturer of quality padlocks and other locking devices, introduced the Lockwood brand when he established Ogden Industries in 1934. The original building was destroyed by fire in 1943, and following Ogden’s death not long after, the company was purchased by Noyes. Production was then moved to the current facility at Oakleigh. A well-known property, Amesfield Park, Upper Beaconsfield, comprising a large residence and a five-roomed bungalow, on 30 acres of land, has been sold. "Mum and Dad are givin me a big Do in some Barn on Saturday an Mabels goin too I reckon Mabels orlwright donch you? Were all meetin at Brendon Evans Court, 2 rack at arf past foive cause the barns a secret an we dont know where it is oi nearly forgot to tell yer that yer invited too so come an jine us in yer ayseed clothes." 28 Oct 1942, Fatal Fall From Horse. UPPER BEACONSFIELD TRAGEDY. WHILE helping to round up some horses at his residence, “Amesfield,” Upper Beaconsfield, last Saturday, Mr. Charles Edward Henderson, 50, a well known resident of the district was killed, apparently by a fall from his horse. Nobody saw what happened and the first inkling anybody had of the tragedy was when Mr. Henderson’s riderless horse came galloping up. When Mr. J. S. Ogden whom deceased was assisting with the horses, went to investigate, he found deceased lying on the ground almost lifeless. He immediately got in touch with Dr. Leonard Langmore, of Berwick, but when he arrived he pronouced life extinct. Constable Bryant, of Berwick, was informed of the accident, and later Mr. McNabb, J.P., opened an inquest on the Monday, adjourning it to a date to be fixed. The late Mr. Henderson was a native of Aberdeen (Scotland) but had been out here for 16 years. He was very highly thought of throughout the Upper Beaconsfield district where the deepest sympathy is felt for his bereaved wife. The funeral, which was a private one, moved off from the Presbyterian Church, Berwick, for the Berwick cemetery on Monday, Rev. Cadwallader Jones performing the obsequies. 17 Nov 1943, RE JOHN STANLEY OGDEN, Deceased. [S22] Victorian Government. BDM Index Victoria (online) "#D5427 Place of Birth - BROOKLYN NEW YORK UNITED STATES OF AMERICA." [S33] Australian Government: http://www.naa.gov.au/collection/search/index.aspx, OGDEN John Stanley: Nationality - American: Date of Birth - 13 June 1897: Date of Arrival - 26 March 1926: Arrived per NIAGARA: Certificate Number 15: Date of Issue - 30 October 1939: First Registered at Berwick - Victoria [Contains one black and white photograph]. [S185] Property Titles. ; PROV (Public Records Office Victoria), C/T 5577-246 - Estate of Charles William Campbell to John Stanley Ogden Director and Olga Nellie Herschell Ogden Married Woman both of Amesfield Park Upper Beaconsfield - joint proprietors. [S185] Property Titles. ; PROV (Public Records Office Victoria), C/T 5577-245 - Estate of Charles William Campbell to John Stanley Ogden Director and Olga Nellie Herschell Ogden Married Woman both of Amesfield Park Upper Beaconsfield - joint proprietors. [S5] Registry of Births Deaths and Marriages Death Index Victoria 1921-1985 "#D5427 age 45 [par John Edward OGDEN & Jane CLEMENTS]." [S16] Newspaper - The Age 7 Jun 1943, p3. [S185] Property Titles. ; PROV (Public Records Office Victoria), C/T 5577-246 - Olga Nellie Hershell Ogden of 9 Grange Road Toorak Widow is now the surviving proprietor. [S11] Newspaper - Argus 29 Jun 1937 p4. [S11] Newspaper - Argus 5 Jul 1939 p15. [S11] Newspaper - Argus 10 Jul 1939 p5. [S11] Newspaper - Argus 17 Nov 1943 p14. 10 Jul 1943, UPPER BEACONSFIELD. 60 ACRES. For Immediate Private Sale. Vacant Possession Available. The following is the description of Mrs. Ogden's lovely home in this popular country district:-Many thousands have been spent, making this property the show place of the district. HIGH LOCATION. GLORIOUS VIEWS. Accommodation comprises large lounge landscape windows, playroom, 2 other reception-rooms, several sets bevel glass D. doors, 6 bedrooms, 2 bathrooms, H.W.S., servery, pantry, equipped kitchen. S.S. sink, separate cottage of 5 rooms, garages for 4 cars, cowshed, fowl pens, dairy storerooms, E. light, water, sewerage. PRICE £6000. 4 Dec 1943, SATURDAY, DECEMBER 18. At Three O'clock. On the Premises. 18 Dec 1943, SALES BY AUCTION. UPPER BEACONSFIELD. THIS DAY. At Three O'clock. On the Premises. AMESFIELD PARK, ST GEORGE'S ROAD, UPPER BEACONSFIELD. - SALE BY AUCTION. - DELIGHTFUL TIMBER COUNTRY RESIDENCE, Containing 3 Reception-rooms, 7 Bedrooms. 2 Main Bathrooms, Modern Kitchen and Offices, Hot-water Service, Septic Sewerage, Gardener's Cottage, Consisting of 5 Rooms, Bathroom, &c., Extensive Outbuildings. LAND 60 Acres 1 Rood 18 Perches. This Property is Situated on One of the Highest Positions in the District, and Commands Magnificent Panoramic Views. VACANT POSSESSION. Furniture May be Purchased at Valuation. Title, Certificate, Vendor's Solicitors: Messrs James Hall & Sons, 17 Queen Street, Melbourne. TERMS: One quarter Cash, Balance 3 Years at 5 Per Cent to Home Buyer. [S185] Property Titles. ; PROV (Public Records Office Victoria), C/T 5577-246 - Alexander Scott Mackenzie of Flinders Naval Depot Surgeon Captain in the Royal Australian Navy. [S185] Property Titles. ; PROV (Public Records Office Victoria), C/T 5577-245 - Olga Nellie Herschell Ogden (now proprietor) to Alexander Scott Mackenzie of Flinders Naval Depot Surgeon Captain in the Royal Australian Navy. remains scattered at Springvale Botanical Cemetery. [S28] Victorian Government. BDM Index Victoria (Deaths) (online) "place of birth Melbourne." [S28] Victorian Government. BDM Index Victoria (Deaths) (online) "Place of Birth St Kilda." [S11] Newspaper - Argus 10 Jul 1943, p14. [S11] Newspaper - Argus 4 Dec 1943 p11. [S11] Newspaper - Argus 18 Dec 1943, p11. [S185] Property Titles. ; PROV (Public Records Office Victoria), C/T 2636-151 - Samuel Neville of Beaconsfield Gardener - C/T 3081-082. [S5] Registry of Births Deaths and Marriages Death Index Victoria 1921-1985 "#D15631 age 74 [par unknown]." [S11] Newspaper - Argus 29 Dec 1921 p1. [S185] Property Titles. ; PROV (Public Records Office Victoria), C/T 3081-082 - Samuel Neville died on 28 Dec 1921. Probate has been granted to Raymond Thomson of "Camelot Park" Beaconsfield Farmer. [S185] Property Titles. ; PROV (Public Records Office Victoria), C/T 3081-082 - Edwin Barton Jennings of Beaconsfield Orchardist. bw0901 Neville Samuel 1921 73 erected by his niece. CAMPBELL. The Friends of the late MAJOR CHARLES W CAMPBELL are informed that his remains will be cremated at the Springvale Crematorium. 25 Mar 1895, AN OFFICER AND HIS JACK BOOTS. 11 Mar 1914, MAJOR AND "BUTTONS." - ALTERCATION IN HOTEL. A TECHNICAL ASSAULT. Major Charles W. Campbell, of Amesfield Park, Mornington, was defendant in a case at the St. Kilda Court yesterday, a charge of unlawful assault having been preferred against him by a lad named Harold Godfrey Rudd, hall-boy at the Esplanade Hotel. Mr. J. Woolf appeared for the complainant, and Mr. Hamilton (instructed by Messrs. Woolcott and Drysdale) for the defendant. The bench was occupied by the mayor (Councillor O'Donnell) and Messrs. Mahony, Levi, Smithwick, and Billson, J.P.'s. The complainant, Rudd, stated that on the evening of February 21, Major Campbell, with his daughter and other visitors, sat down to dinner. Witness handed defendant the wine card. Defendant complained of it being in a soiled state, and, saying he did not want any drinks, threw the card on the table. Witness then walked away. He was not cheeky to Major Campbell. Shortly after 8 o'clock witness was standing in the hall of the hotel, when Major Campbell came up and said. "I have reported you to Mrs. McQuade over the wine card." Witness said, "Very well, sir." Defendant then struck him with the palm of his hand, and caught him under the collar, and tried to throw him down, but the witness held on to the stairs. Mrs. McQuade told defendant that if her husband had been there he would have ordered him out of the hotel. Mr. Woolf.-- Were you guilty of any rudeness to Major Campbell? What was his condition? - He seemed to be under the influence of drink. I am not certain. Mr. Hamilton.-Did you ask Mrs. McQuade for a clean wine-card? Witness.-No. Would money have squared this case? Mr. Woolf had the case in hand. On behalf of yourself and your father, Mr. Woolf wrote to defendant, claiming £40 damages, saying "Unless I receive a cheque for the damages I shall proceed without further notice. "- I told Mr. Woolf what I am telling you now. Mrs. Margaret McQuade, wife of the licensee of the Esplanade Hotel, said: -- Major Campbell complained to me about the boy Rudd's impertinence. Mr. Woolf. -- You are an unwilling witness. You did not want to come here? Witness.-- No. I did not see Major Campbell strike the boy. I saw him put his hand on the boy's shoulder and push him. I said, "Mr. Campbell!" and he at once desisted. Did you tell defendant he ought to be ashamed of himself ?-- No. Joseph Peckham, head boots and porter, said that on the night in question the major appeared to be very "abrupt." He saw defendant get hold of the boy by the neck and shoulders, when Mrs. McQuade interfered. He heard Major Campbell say that the wine-card was not fit to put before a pig. In opening: the case for the defence, Mr. Hamilton said that the whole affair was of a trivial character, and had been greatly magnified. Defendant said that the wine-card which complainant- handed him was filthy dirty, and witness refused to take it. He (defendant) was perfectly sober that night, as he presided at the meeting of the St. Kilda Dinghy Club. To do the boy justice, he (defendant) would say that the actual words Rudd used might not appear to be impudent, or cheeky, but his whole demean- our was. The tips of his fingers only touched, Rudd's face. He caught him by the collar to take him to Mrs. McQuade. Mr. Woolf.--Are you a major?-- Yes, in the field artillery, for 22 years. Is a major supposed to be an officer and a gentleman?-- Yes, by act of Parliament. Is it gentlemanly to strike a boy of that size?-- Circumstances alter cases. Cecil Gillam, clerk in the Commonwealth Treasury, one of the party who had dinner with Major Campbell, said the boy Rudd, when spoken to about the wine-card, said he did not have another, and was insulting in his remarks. In the first instance, defendant had to send two waiters for a wine-card. Witness did not see the alleged assault. 20 Jan 1932, Volunteers Thanked. 29 Jun 1933, CLEARING SALE. Messrs. Gamble, Anderson, Lamb Pty. Ltd., of Berwick, report having conducted a very successful clearing sale at “Amesfield Park,” Upper Beaconsfield, on Wednesday, June 21. Under Instructions from Colonel Chas. W. Campbell, who is Leaving the District. This Delightful Home. Situate In Ideal Surroundings, Comprises the Main Residence. Which Contains Lounge Dining-room, Verandah Lounges, smokeroom, Study, 4 Bedrooms, Dressing-room, and Ample Domestic Adjuncts. There Is Also an Attractive Bungalow, Containing Lounge, Dining room, 3 Bedrooms, Kitchen, &c. Numerous Other Improvements Include Ballroom, supper-room, Sun Parlour, Two Garages, Man's Quarters, 5 Storerooms, &c. Splendid Water Service Re ticulates from 12,000 and 5000 gallon Tanks; Windmill Pump, Electric Light, and Hot-water Service. Superb Views from the Homestead, Which is surrounded by Splendid Gardens and Lawns. The Land Comprises 2 Holdings, Each of 30 Acres. Immediately After the Sale of the Property. Comprising Lounge and Bedroom Furniture, Carpets, Rugs, China. Kitchenware, Frigidaire, Engineer's Tools. Garden and Farm Implements, Motor-truck, &c. &c.
22 May 1937, TUESDAY, MAY 25. AT THREE O'CLOCK. This Delightful Home, Situate in ideal Surroundings, comprises the Main Residence, Which Contains Lounge, Dining-room, Verandah Lounges, Smoke-room, Study, 4 Bedrooms, Dressing-room, and Ample Domestic Adjuncts. There Is Also a Bungalow, Containing Lounge, Dining-room, 2 Bed- rooms, Kitchen, &c. Numerous Other Improvements Include Sun Parlour, 2 Garages, Man's Quarters, 5 Storerooms, &c , Splendid Water Service Reticulates From 22,500 and 5000 gallons Tanks, Electric Light and Hot-water Service, Superb Views Irom the Homestead, Which Is Sur- rounded by Gardens and Lawns. The Land Comprises 2 Holdings, Each of 30 Acres. CAMPBELL, CHARLES (1840-1905), merchant and pastoralist, was born on 14 January 1840 at Aberdeen, Scotland, son of Duncan Campbell, cattle driver, and his wife Catherine, née McLean. Charles migrated to the Victorian goldfields in 1858, working at Woodend as agent for a firm of carriers before moving to New Zealand, where he became a successful flour-miller at Dunedin. Returning to Melbourne in the late 1860s he entered the lime business, and prospered. On 5 June 1861 in Wesley Church, Lonsdale Street, Melbourne, he had married Mary Ellen Smith, who had been born at Berwick-upon-Tweed, England. They were to have four sons and six daughters. In 1872 Campbell was approached by the farrier James Cuming, an Aberdonian friend of his youth, to join in buying an acid works at Yarraville formerly managed by Cuming's brother-in-law George Smith. Campbell put up £3300 of the £4000 required, and as senior partner of Cuming, Smith & Co. led the new firm's diversification into fertilisers in 1875. In 1872 he had skilfully negotiated agreements to protect the market when customers Alfred Felton and F. S. Grimwade, wholesale druggists, built an acid works in competition; later Campbell and Cuming worked with Felton and Grimwade setting up an acid works in New Zealand (which Smith ran from 1880) and forming in 1882 the Adelaide Chemical Works Co. Excellent managers, the partners re-invested profits, eschewed speculation and easily survived the 1890s depression. By 1897, when Felton Grimwade merged their acid works in a reconstructed Cuming, Smith & Co., the firms were a major force in Australia's chemical and fertiliser industries. Campbell was also a founder of the successful Apollo Stearine Candle Co, and in 1888 joined Grimwade in founding the Royal Bank, the only Melbourne bank not to suspend payments in 1893. With James Service, C. E. Miller and others he established the Port Melbourne Sugar Co., which later merged with Colonial Sugar Refining Co., a major survivor when the sugar boom faltered. Becoming, like many Melbourne merchants, a pastoralist, he invested in the Malvern Hills Pastoral Co. of Queensland, and in 1884 formed an equal partnership with Felton to purchase Murray Downs, a station of some 97,000 acres (39,255 ha) near Swan Hill. The partners spent heavily on improvements, spreading much superphosphate—presumably of their own manufacture—and establishing the largest irrigated area of the time on the Murray. In 1889 the station sent 327 bales of wool down river to the railhead at Echuca, but wool prices fell in the 1890s and drought was a recurrent problem. Campbell helped to set up the Pastoralists' Association of Victoria and Southern Riverina, became its treasurer, and was thanked by its council for services (unspecified) during the great strike of 1891. In 1885 Campbell had joined Felton in supporting Rev. Charles Strong, the charismatic preacher expelled from Scots Church, encouraging him to found another. Described by Felton as 'the ablest practical head that the confraternity can claim', Campbell helped to build Strong's new Australian Church, and in 1897 was one of four 'proprietors' who cleared the building of debt and rented it back to the Church. By then he had joined Scots Church, where a window was later installed in his memory. In maturity Campbell was bearded, bald and genial, but keen-eyed; Felton always admired his 'stubborn strength'. His family was established in Wollahra, a mansion in East Melbourne, but spent much time at Murray Downs; one daughter married the station manager and in 1895 his son Alec drowned there, on his twenty-first birthday, a few months after the death of Cameron's oldest daughter. [S35] Probate Records, PROV (Public Records Office Victoria), VPRS 28/P3, unit 2943; VPRS 7591/P2, unit 1009. [S1] Registry of Births Deaths and Marriages Pioneer Index Victoria 1836-1888 "#B4247." [S2] Registry of Births Deaths and Marriages Federation Index Victoria 1889-1901 "#M3231." [S80] Ancestry - Family Tree, owner: Emmett Family Tree - Owner: arpemmett. [S14] Newspaper - Prahran Telegraph, 1 Jul 1893, p2. [S185] Property Titles. ; PROV (Public Records Office Victoria), C/T 2782-212 - Christine Maybelle Drake to Charles William Campbell of Upper Beaconsfield Gentleman - C/T 5577-245. [S185] Property Titles. ; PROV (Public Records Office Victoria), C/T 1750-965 and 966 - Christine Maybelle Drake to Charles William Campbell of Upper Beaconsfield Gentleman - C/T 5577-246. [S5] Registry of Births Deaths and Marriages Death Index Victoria 1921-1985 "#D11023 age 68 [par Charles William CAMPBELL & Mary Helen SMITH]." [S11] Newspaper - Argus 29 Oct 1936 p1. [S185] Property Titles. ; PROV (Public Records Office Victoria), C/T 5577-245 - Charles William Campbell died on 28 October 1936. Probate of his will has been granted to the Trustees Executors and Agency Company Limited of 412 Collins Street Melbourne and Colin York Syme of 103 William Street Melbourne Solicitor. [S11] Newspaper - Argus 11 Mar 1914, p14. [S11] Newspaper - Argus 28 Sep 1925, p1. [S14] Newspaper - Table Talk, 14 Apr 1927, p41. [S11] Newspaper - Argus 6 May 1933, p16. [S11] Newspaper - Argus 16 Mar 1935 p2. [S11] Newspaper - Argus 22 May 1937 p18. [S11] Newspaper - Argus 26 May 1937, p18. A. Croft, History of Murray Downs Station (Swan Hill, Vic, 1965); J. R. Poynter, Russell Grimwade (Melb, 1967); James Cuming: An Autobiography, edited by J. Lack after M. A. Cuming (Melb, 1987); J. Lack, A History of Footscray (Melb, 1991); J. R. Poynter, Mr Felton’s Bequests (Melb, 2003); Pastoralists’ Review, 16 Oct 1905, p 627; Argus (Melbourne), 14 Sept 1905, p 5; Australasian, 16 Sept 1905; Felton Grimwade papers (University of Melbourne Archives); Cuming Smith papers (University of Melbourne Archives); Felton Bequest papers (State Library of Victoria). Print Publication Details: J. R. Poynter, 'Campbell, Charles (1840 - 1905)', Australian Dictionary of Biography, Supplementary Volume, Melbourne University Press, 2005, pp 61-62. Death-Notice* 3 May 1955 STOTT. - On May 1, at Amesfield, Upper Beaconsfield, Harold, beloved husband of Freda, and loved father of Geoffrey, David, Donald, and Robin (deceased). STOTT. - Harold, a tribute of respect from the directors and staff of Ramsay & Hall Pty. Ltd. for our chairman of directors, who passed away. May 1. STOTT Funeral of the late HAROLD STOTT will arrive at the Spring Vale Crematorium. THIS DAY (Tuesday), at 11.15 a.m.
7 Jan 1935, STOTTS BUSINESS COLLEGE. HALF A CENTURY OF PROGRESS. 1 Oct 1952, A Poser For The Ranger! H. STOTT, of Upper Beaconsfield, complained to the September meeting of the Berwick Council that deer were damaging his garden in St. George’s Rd. Smiles broke out around the council table when the writer suggested that the shire ranger might possibly know the haunts of the deer and take steps to clear them out. The President (with a smile): I don’t think the ranger has power to impound them ! “I move that the matter be left in the hands of Cr. Ure and that he bring down the venison for our next council dinner!”, put in Cr. Kinsella jocularly. Cr. Ure, who has had some success in stalking deer, quickly retorted : “Let’s refer it to some sportsmen, such as Crs. Greaves, Kinsella and Ronald. They hunt foxes and I think they could overcome the problem ! I’ve watched for years and would like to know if the huntsmen ever get any foxes ! “If you read the local paper you’d have seen where we got three!”, parried Cr. Ronald, amidst laughter. Harold Stott, of William st., Melbourne, but late of Upper Beaconsfield, company director, who died on May 1 last year, left estate valued for probate at £72,919 to his widow and sons. [S35] Probate Records, PROV (Public Records Office Victoria), VPRS 28/P4, unit 1324; VPRS 7591/P3, unit 157. [S5] Registry of Births Deaths and Marriages Death Index Victoria 1921-1985 "#D5488 age 67 [par Leonard Sydney Henry STOTT & Eleanor TWYFORD]." [S11] Newspaper - Argus 14 Oct 1939 p8. [S56] Berwick-Pakenham Historical Society, In the wake of the pack tracks, p63. [S11] Newspaper - Argus 3 May 1955, p17. [S11] Newspaper - Argus 7 Jan 1935 p5. [S11] Newspaper - Argus 27 Apr 1956, p15. [S35] Probate Records, PROV (Public Records Office Victoria), VPRS 28/P9, unit 267; VPRS 7591/P5, unit 51. [S185] Property Titles. ; PROV (Public Records Office Victoria), C/T 5577-245 - Alexander Scott Mackenzie to Freda Grace Stott of 37 Mercer Road Armadale Married Woman. [S15] Newspaper - Village Bell "037-1984 p8+9 by John Milligan." [S185] Property Titles. ; PROV (Public Records Office Victoria), C/T 5577-245 - Freda Grace Stott excised 25a 2r 20p - C/T 8225-680. [S185] Property Titles. ; PROV (Public Records Office Victoria), C/T 8225-680 - Freda Grace Stott to Geo M Hume Pty Ltd of 220 Collins Street Melbourne. [S185] Property Titles. ; PROV (Public Records Office Victoria), 8715-359 - Cornelis De Vreugt Clerk and Pamela Mary De Vreugt Married Woman both of 80 Aitken Street Gisborne - joint proprietors. [S185] Property Titles. ; PROV (Public Records Office Victoria), C/T 5577-245 - Freda Grace Stott died on 22 February 1979. Probate of her will has been granted to the Union-Fidelty Trustee Company of Australia Limited of 100 Exhibition Street Melbourne and Robert Brian Vance of 113 Warrigal Road Surrey Hills Chartered Accountant. CAMPBELL.-On April 9, Emma, loved mother of Kathleen Kibby. [S5] Registry of Births Deaths and Marriages Death Index Victoria 1921-1985 "#D3468 age 83 [par PATON]." [S11] Newspaper - Argus 10 Apr 1948, p2. [S50] Miscellaneous Source, Biographical index of South Australians, 1836-1885 (a good resource but not always 100% accurate). Occupation Farmer and resided at Thebarton, Lyndoch and Adelaide. Children Ann [1815-], William [1817-1905], Catherine [1819-], Elizabeth [1820-], Jane LASHMAR [1822-1864], John [1824-], dau [1827-], dau [1828-], dau [1828-]. Parent's marriage: William RUSHALL & Hannah SHURRON #7250011. Record extracted from Oxfordshire Marriage Transcripts, 1538-1837, compiled by J. S. W. Gibson. (The index was based on the groom index, film numbers 54,396 to 54,397.)." Rushall Jane (daughter of William and Hannah). CHURCH OF ENGLAND, MONUMENTAL, COMPARTMENT C GRAVE 25. [S14] Newspaper - The Advertiser (Adelaide) 31 Mar 1905, p4. Note City of St Kilda Building Permits Register, no 155. weatherboard addition. fee paid 2s.6d. [S3] Registry of Births Deaths and Marriages Edwardian Index Victoria 1902-1913 "Birth year calculated from birth certificate of son Albert in 1855, where she said she was 22 years old, but her death certificate also said she was 22 at the time of her marrigae in 1853." [S31] IGI "possible christening: 26 Mar 1837 (born 19 Jan 1837) Church of Christ-Independent Edenbridge, Kent, C068211 [par John GOWER & Elizabeth]." [S185] Property Titles. ; PROV (Public Records Office Victoria), C/T 1297-366: Arthur Knight to Elizabeth Rushall - see C/T 1552-218 Elizabeth Rushall, of Fawkner Street, St Kilda, widow. [S185] Property Titles. ; PROV (Public Records Office Victoria), C/T 1297-366: Arthur Knight to Elizabeth Rushall - see C/T 1889-603 Elizabeth Rushall, of Fawkner Street, Saint Kilda, widow. [S185] Property Titles. ; PROV (Public Records Office Victoria), C/T 1889-603 Transfer as to part (on same day) - Elizabeth Rushall to Mary Ann Hollow - see C/T 1889-604 - Mary Ann Hollow the wife of Joseph Hollow of Burnley Street Richmond Builder and Contractor. [S185] Property Titles. ; PROV (Public Records Office Victoria), C/T 1070-868 The Universal Permanent Building and Investment Society to Elizabeth Rushall of Fawkner Street Saint Kilda Widow. [S185] Property Titles. ; PROV (Public Records Office Victoria), C/T 2636-152 & C/T 3170-909 - Elizabeth Rushall of Robe Street St Kilda Widow - C/T 3170-931. [S185] Property Titles. ; PROV (Public Records Office Victoria), C/T 2636-152 - title then cancelled - C/T 4527-239 (20 Dec 1921) - Jane Corder and Mary Eliza Corder both of Upper Beaconsfield Spinsters - joint proprietors of 30a 2r 2p. [S11] Newspaper - Argus 2 Sep 1911 p13. [S35] Probate Records, PROV (Public Records Office Victoria), 124/655. [S185] Property Titles. ; PROV (Public Records Office Victoria), C/T 3170-931 - Red Ink No 1888794. Elizabeth Rushall died on the 30th day of August 1911. Probate of her will was granted to Alexander Rushall of Queen Street Melbourne Clerk with Albert Edward Ernest Rushall now deceased. [S185] Property Titles. ; PROV (Public Records Office Victoria), C/T 4357-363 (combines the two properties) - part sold to Eleanor Rhoda Tilley on 5 Oct 1922, balance retained to 19 Aug 1960. [S185] Property Titles. ; PROV (Public Records Office Victoria), C/T 3170-931 - Alexander Rushall of 31 Queen Street Melbourne Gentleman. [S16] Newspaper - The Age 15 Mar 1867, p2. [S16] Newspaper - The Age 20 Dec 1890, p6. [S11] Newspaper - Argus 23 Dec 1893 p1. Death-Notice* 17 Jul 1917 RUSHALL-On the 16th July, at "Langower," Robe street, St. Kilda, Albert Edward Ernest Rushall, of the firm of F. W. Prell and Co.
RUSHALL - The Friends of the late Mr ALBERT EDWARD ERNEST RUSHALL are respectfully invited to follow his remains to the place of interment the Brighton Cemetery. 3 Nov 1890, NOTICE is hereby given, that Messrs ALBERT EDWARD RUSHALL and STEWART HERMANN PRELL have this day been ADMITTED as PARTNERS into our firm. 18 May 1892, ALLEGED EMBEZZLEMENT BY A BANK CLERK. HENRY WALTER EYLES BEFORE THE COURT. COMMITTED FOR TRIAL. ...(excerpt) Albert Edward Ernest Rushall, a member of the firm of F W Prell and Co , said he and Mr F W Prell were the only persons authorised to sign cheques on behalf of the firm. The cheque for £300 referred to in the pay-in slip was never drawn by himself or Mr Prell. 31 Mar 1899, NOTICE is hereby given, that the Partnership existing between us the undersigned, Friederich Wilhelm Prell, Albert Edward Ernest Rushall, and Stewart Hermann Prell, as Merchants, carrying on business in Melbourne, under the style of F. W. Prell and Co., and in London at 72, Bishopsgate-street Without, under the style of Prell Rushall and Co. has this day been dissolved. —Dated this twenty-fourth day of March, one thousand eight hundred and ninety-nine. 27 Aug 1902, Tea merchants in the toils. 25 Oct 1905, WHEAT AGENT CHARGED. In the City Court to-day Alexander Wilson, a young man, was charged with converting 119 bags of wheat the property of F. W. Prell and Co., to his own use. Accused denied the charge. Albert Rushall, a member of the firm of F. W. Prell and Co., said that defendant was a commission agent of Rosebery, near Beulah. Mr. Friedrich Wilhelm Prell, who for many years has figured in the business and social life of Melbourne, died early on Saturday morning, at his residence, Iona, St George's Road, Toorak. His illness was a brief due, and his death was the direct result of a chill caught only last Tuesday morning. Mr Prell had, however, been suffering from lung trouble for some years, an attack of influenza, contracted many years ago, having left him prone to the repeated attack of bronchitis. He leaves a family of six, his wife having died seven years ago. Mr Prell was, perhaps, one of the best known figures in Melbourne commercial life. His name is associated with the block of buildings which he erected in Queen-street just prior to the big boom of 1893. He practically introduced to Melbourne the system of erecting big blocks which could be let in flats and offices, and he was practically the first man to introduce the now common system of elevators in these blocks. In business his word was his bond. The strenuousness with which he devoted himself to his business marked all that he touched in life. He walked, rowed, and raced with the same enthusiasm, and in his home life played billiards and chess with such keenness that, with Dr Fred Bird, he was at one time one of the best amateur billiard players in Victoria. Those whose memory of athletics in Melbourne goes back to 1880 will recall the Ancient Mariner's Rowing Club, and Mr Prell's connection with it. In fact, the world of sport has seen much of the late Mr Prell. He rode to hounds until old age prevented him doing so any longer. He was passionately fond of horses, and always kept good animals. At one time he won a Hunt Club Cup with a horse called Caliph, which was ridden by Sir Frank Madden. As far back as 1878 or1879 he won the Newmarket Handicap with a horse called Tom Kirk, which afterwards ran second in the Melbourne Cup. With Mr Power he was for some time hon. auditor of the V.R.C., and always took a great interest in the club and its doings. Mr Prell was of German descent, having been born in Hamburg over 80 years ago. He received his education in his native country, and came out to Australia when 21 years of age. In Sydney, he started as a member of the firm Ager and Prell. Five years later he dissolved partnership there and came to Melbourne, where he founded the firm of F. W. Prell and Co. Limited. His treatment of those who worked for him may be gauged from the fact that Mr A. E. Rushall, a partner in the firm, started his business career with Mr Prell as a boy, and has never left the firm, remaining in later days as a partner with the founder. Mr. Prell's business as a merchant was of an extensive character, both in the import and export trade, the considerable extent to which he participated in the development of the wheat export trade of Victoria representing only one phase of his multifarious activities. His long career covered a period in which great changes have taken place in the methods by which the world's commerce is carried on, changes in which Australian trade has shared along with that of other countries, and he brought a keen and well-trained intellect to bear in adapting himself to the changing conditions. As a business man his reputation was of the highest, and he enjoyed in the greatest degree the respect and esteem of all who came on with him. In 1859 Mr Prell married Miss Jessie Usher Dunlop, of Edinburgh. He was buried yesterday, the day that would have been his wife's birthday anniversary had she lived. He leaves a family of six. His eldest son is Mr Stewart Prell, who is an orchardist in Tasmania, while the second son is Mr Charles Prell, who is a pastoralist, near Goulbourn, New South Wales. His third son, Mr Harry Prell, has been in his father's firm for a number of years past, and is a well-known figure in commercial circles. The eldest daughter is the wife of Mr G. Fairbairn, M.H.R; the second is the wife of Mr F Keating, of Anthony Gibbs, and Sons, financiers, London, and the third was married to Mr James E Hayes, of Gibbs, Bright, and Co.
26 Jul 1917, The late Mr. Alfred Rushall, who died last week, was an example of a man who, despite bodily infirmity and suffering, won his way to success. He was always genial and kindly, and those who met him, whether as friends or in business, were impressed with this disposition. Entering the office of F. W. Prell and Co. forty years ago, he rose to be a partner of the firm in 1889. About this date the foundations of the large buildings associated with Prell's were laid, and he to a large extent planned and saw them built. When pioneering the wheat export trade, Mr. Rushall rendered substantial assistance. Since the death of Mr. F. W. Prell in 1912, Mr. Rushall has been in partnership with Mr. Harry Prell. 7 TO 11 QUEEN STREET MELBOURNE 3000. [S1] Registry of Births Deaths and Marriages Pioneer Index Victoria 1836-1888 "#B11821." GSV library location: 929.33945 VIC." [S20] Various indexed records of GSV - Genealogical Society Victoria "Dunolly Hospital Admissions register 1860-1900. Age: 14 Religion: C of E Discharged: 31 Jan 1872." [S4] Registry of Births Deaths and Marriages Great War Index Victoria 1914-1920 "#D10459 age 58." [S11] Newspaper - Argus 17 Jul 1917 p1. [S35] Probate Records, PROV (Public Records Office Victoria), 155/176. St Kilda. Merchant. [S11] Newspaper - Argus 1 Nov 1890, p8. [S11] Newspaper - Argus 3 Nov 1890, p10. [S16] Newspaper - The Age 8 Nov 1890, p10. [S11] Newspaper - Argus 18 May 1892, p10. [S14] Newspaper - Melbourne Punch, 8 Aug 1895, p5. [S11] Newspaper - Argus 28 Oct 1897, p6. [S14] Newspaper - The London Gazette, 31 Mar 1899, p2180. [S14] Newspaper - Bendigo Advertiser, 27 Aug 1902, p3. [S14] Newspaper - Mount Alexander Mail (VIC), 25 Oct 1905, p2. [S11] Newspaper - Argus 29 Apr 1912, p13. [S14] Newspaper - Table Talk, 26 Jul 1917, p17. [S1] Registry of Births Deaths and Marriages Pioneer Index Victoria 1836-1888 "#B9647." [S1] Registry of Births Deaths and Marriages Pioneer Index Victoria 1836-1888 "#D5549 age 5." Death-Notice* 16 Feb 1922 BATES. - On the 15th February (suddenly), at "Nyanza," Fawkner street, St. Kilda, Flavouer Elizabeth, relict of the late Edward Bates. No other births to this couple in SA. (Lookup via Rootschat - Alison - 28/04/2011)." [S2] Registry of Births Deaths and Marriages Federation Index Victoria 1889-1901 "#M4319." [S11] Newspaper - Argus 27 Aug 1892 p1. [S185] Property Titles. ; PROV (Public Records Office Victoria), C/T 1964-749 - The Commercial Bank of Australia to Flavouer Elizabeth Bates of Fawkner Street St Kilda Married Woman. [S4] Registry of Births Deaths and Marriages Great War Index Victoria 1914-1920 "#D15479 age 73 [par Richard BATES & Horatia THOMPSON]." [S5] Registry of Births Deaths and Marriages Death Index Victoria 1921-1985 "#D3289 age 63 [par John RUSHALL & Elizabeth GOWER]." [S11] Newspaper - Argus 16 Feb 1922 p1. [S35] Probate Records, PROV (Public Records Office Victoria), 182/876 Widow St Kilda. [S185] Property Titles. ; PROV (Public Records Office Victoria), C/T 1964-749. [S124] Electoral Roll for Australia, 1924 "listed as Flavouer Elizabeth Bates in 1924, may have been her daughter." [S61] Upper Beaconsfield History Archive ,"Dr South's book - not everything is accurate in here." [S65] Ancestry - various indices, Ancestry.com. Birmingham, England, Baptisms, 1813-1912 [database on-line]. Provo, UT, USA: Ancestry.com Operations, Inc., 2013. [S11] Newspaper - Argus 2 Oct 1915 p11. [S2] Registry of Births Deaths and Marriages Federation Index Victoria 1889-1901 "#B26776." [S22] Victorian Government. BDM Index Victoria (online) "#D144/1987 birthplace Melbourne." [S35] Probate Records, PROV (Public Records Office Victoria), VPRS 28/P17, unit 28; VPRS 7591/P13, unit 4. Wedding bells rang out above St John s Church Toorak and the sunshine gleamed on the swords upraised to form an arch of honour above Desiree Ursule, elder daughter of Mr and Mrs Cecil Finch of Caroline street, South Yarra and Commander James Claude Durie Esdaile as they left the church after their marriage yesterday afternoon. In the interior of the church great banks of white and golden flowers were massed against the pulpit and were arranged in feathery clusters on the tall staves lining the aisle. The brides lovely gown was of gleaming ivory satin with a slender trained skirt and softly draped bodice. Beneath the filmy tulle veil held in place with a coronet of orange blossom and green leaves a short veil of exquisite old Limerick lace hung cape-fashion from the shoulders. The veil which is more than 200 years old was lent by Miss Mabel Lilley. The bride's bouquet was of creamy roses shading to pale gold. She was attended by two bridesmaids her sisters Miss Denise Finch and Miss Ainslie Williams and three small boys Pat and Rory Burnett and Rod O Connor clad in white sailor suits. The bridesmaids' frocks were of heavy cream mant crepe embroidered with small golden spots made ankle length with softly draped bodices and gracefully hanging skirts. Wide sashes of the same material as the frocks lined with golden tissue were knotted at the back and fell to the hem. The maids carried bouquets of golden roses and wore wreaths of golden flowers in their hair. Naval uniforms with all the splendour of gold braid which were worn by the groom and his attendants and the guard of honour added to the picturesque scene. The bride was given away by her father and the officiating clergyman was the chaplain of Flinders Naval Depot (the Rev George Stubbs). The groom, who is the second son of Mr and Mrs Thomas Esdaile, Broken Hill (NSW) was attended by Paymaster Lieut Commander P Perry as best man and Lieut Commander B Barwood. [S2] Registry of Births Deaths and Marriages Federation Index Victoria 1889-1901 "#B24329 [par Thomas ESDAILE & Martha DURIE]." [S11] Newspaper - Argus 4 Dec 1934, p5. [S185] Property Titles. ; PROV (Public Records Office Victoria), C/T 4432-287 - James Claude Durie Esdaile of 202 Kooyong Road Toorak Naval Captain. [S185] Property Titles. ; PROV (Public Records Office Victoria), C/T 6595-951 - small part GEM-D-44. [S15] Newspaper - Village Bell "060-1988 p13 John Milligan: The Old Orchards of Upper Beaconsfield." [S185] Property Titles. ; PROV (Public Records Office Victoria), C/T 4192-206 - Thomas Bibby Guest, Biscuit Manufacturer Arthur George Billing, Oil Company Executive and James Claude Durie Esdaile, Retired Naval Officer all of Upper Beaconsfield - joint proprietors. [S15] Newspaper - Village Bell "095-1993 p10 R.S.L CLUB OF U.B. A Short History by Charles Wilson." [S185] Property Titles. ; PROV (Public Records Office Victoria), C/T 4432-287 - Elizabeth Douglas Ballantyne of "L'Aiglon" Salisbury Road Upper Beaconsfield Married Woman - C/T 8874-933. [S185] Property Titles. ; PROV (Public Records Office Victoria), C/T 8874-933 - C/T 9528-443 - Guliema Henrietta Grice of 38 Pasley Street South Yarra Widow. [S185] Property Titles. ; PROV (Public Records Office Victoria), C/T 4192-206 - James Claude Durie Esdaile is now the surviving proprietor. [S185] Property Titles. ; PROV (Public Records Office Victoria), C/T 4192-206 - James Claude Durie Esdaile of Emerald Road Upper Beaconsfield Francis Geoffrey Conn of Armstrong Road Upper Beaconsfield John William Henry Toon of 11 Lloyd Ave Narre Warren & Leo James Welch of Cnr Lye Road and Dixon Road Ripplebrook - joint proprietors. [S11] Newspaper - Argus 3 Sep 1934 p5. Containing 9 rooms, bathroom, verandah on 3 sides and enclosed back verandah, outbuildings consist of laundry, dairy, stable of 2 stalls, harness-room, 2 buggy-sheds, man's room and loft, 6 G.I. tanks. Fine plantation of well-grown pine and other ornamental trees, small orchard, &c., fronting the main road. The whole property forms a complete country retreat for a city gentleman, or for a boarding, house or convalescent home, delightfully situated in this health district, within easy, reach of the city. The position is all that can be desired, being situate 5 miles from Beaconsfield Railway Station, adjacent to Post-office, Stores, Assembly Hall, Tennis-court, and Recreation Ground. ON LAND 95 ACRES 2 ROODS 4 PERCHES, Fronting Main Road, and Other Government Roads. Opposite the above, fronting the main road, suitable for country home, orchard, or small farm. TERMS—Deposit equal to ¼ of purchase money, and balance within three years at 6 per cent interest half-yearly. [S185] Property Titles. ; PROV (Public Records Office Victoria), C/T 2195-903 - Sydney Casey of "Windarra" Upper Beaconsfield Esquire. [S185] Property Titles. ; PROV (Public Records Office Victoria), C/T 2201-160 - Sydney Cornelius Casey of "Windarra" Upper Beaconsfield Esquire. [S185] Property Titles. ; PROV (Public Records Office Victoria), C/T 2170-929 - Sydney Cornelius Casey of "Windarra" Upper Beaconsfield Esquire. [S185] Property Titles. ; PROV (Public Records Office Victoria), C/T 1338-465 + C/T 1162-218 + C/T 3521-114 - Sydney Casey of "Windara" Upper Beaconsfield Gentleman - C/T 3749-707 (consolidated with GEM-D-44B, part of GEM-D-44). [S185] Property Titles. ; PROV (Public Records Office Victoria), C/T 1338-465 - Sydney Casey of "Windara" Upper Beaconsfield Gentleman - C/T 3749-707 (consolidated with GEM-D-44B, part of GEM-D-44). all of GEM-D-44B and part of GEM-D-44. [S185] Property Titles. ; PROV (Public Records Office Victoria), C/T 3749-707 - Claud Alfred Harris of Upper Beaconsfield Cartage Contractor - C/T 5458-544. [S185] Property Titles. ; PROV (Public Records Office Victoria), C/T 2195-903 - Leah Victoria Annabella Kellaway of 49 Rathmines Road Auburn Married Woman. [S11] Newspaper - Argus 22 Oct 1935, p1. [S185] Property Titles. ; PROV (Public Records Office Victoria), C/T 2201-160 + 2170-929 - Sydney Cornelius Casey herein called Sydney Casey died on the 21 October 1935. Probate of his will has been granted to Violet Casey Widow and Sydney John Casey Grazier both of Cleve Berwick. [S185] Property Titles. ; PROV (Public Records Office Victoria), C/T 2170-929 - Ernest Henry Grant of Beaconsfield Orchardist. [S185] Property Titles. ; PROV (Public Records Office Victoria), C/T 2201-160 - Ernest Henry Grant of Beaconsfield Orchardist. [S19] Newspaper - Berwick Shire News and Pakenham and Cranbourne Gazette "5 Jan 1916, p2." [S11] Newspaper - Argus 4 Nov 1922, p3. [S2] Registry of Births Deaths and Marriages Federation Index Victoria 1889-1901 "#D14783 age 33 [par Samuel LAMROCK & Matilda MAGEE], also #D492 (1891)." [S2] Registry of Births Deaths and Marriages Federation Index Victoria 1889-1901 "#M3417." [S11] Newspaper - Argus 21 May 1889 p1. [S11] Newspaper - Argus 5 Nov 1890 p1. [S1] Registry of Births Deaths and Marriages Pioneer Index Victoria 1836-1888 "#B11912 [par Robert CALDWELL & Elizabeth COOPER]." [S2] Registry of Births Deaths and Marriages Federation Index Victoria 1889-1901 "#M3263." [S11] Newspaper - Argus 14 Jul 1900 p9. [S7] Registry of NSW Births Deaths and Marriages "#D13649 [par Robert & Elizabeth]." [S11] Newspaper - Argus 5 Aug 1920 p1. Cuthbert Robert Lamrock was a 24-year old commission agent when he enlisted. He was a Corporal with the 6th Light Horse Regiment, A Squadron. SERN 57. His mother and stepfather had an orchard in Stoney Creek Road. [S11] Newspaper - Argus 10 Jul 1916, p8. [S2] Registry of Births Deaths and Marriages Federation Index Victoria 1889-1901 "#B19888." [S11] Newspaper - Argus 18 Aug 1890 p1. [S11] Newspaper - Argus 29 Mar 1919 p13. [S80] Ancestry - Family Tree, Martin Family Tree Owner: sbankvet. [S11] Newspaper - Argus 10 Jul 1916 p8. [S83] Online index to the UK census "1871-1881 census." [S185] Property Titles. ; PROV (Public Records Office Victoria), C/T 3547-291 + C/T 3498-401 - George Reid Grieve of Upper Beaconsfield Orchardist. [S185] Property Titles. ; PROV (Public Records Office Victoria), C/T 3547-291 + C/T 3498-401 - Mortgage No 328479 - discharged 26 Feb 1920. [S185] Property Titles. ; PROV (Public Records Office Victoria), C/T 3547-291 + C/T 3498-401 - Henriette Matilda Farrington of 63 Russell Street Melbourne Spinster. [S83] Online index to the UK census "Parish: Abbotshall; ED: 29; Page: 5; Line: 3; Roll: cssct1881_122." [S14] Newspaper - Sydney Morning Herald, 25 Aug 1922, p6.